Book your luxury Barbados holiday today and stay at Spinnaker, a holiday villa with 3 bedrooms, 3.5 bathrooms, a private berth and plunge pool. Vacation in Barbados on the island’s beautiful Platinum Coast while staying in this fully furnished, secure property with easy access to one of the island’s best beaches. Enjoy the modern amenities of the Port St. Charles Resort while being steps away from the quaint charm of historic Speightstown, Barbados’ second largest town centre affectionately known as ‘Little Bristol’. Spinnaker is tastefully furnished and fully air-conditioned. Each room has been designed to provide the feel of a luxury resort while also including the comforts of a home away from home. The fully equipped kitchen gives guests the opportunity to start the morning at the breakfast bar before setting off to see the sights. Relax in the spacious living room with large, flat screen TV or walk out on to the outdoor terrace with bar, dining area and plunge pool overlooking the famed Port St. Charles lagoon. The bedrooms boast stunning views and accommodate 6 people. Spinnaker is located within the Port St. Charles resort located on the North Western coast of Barbados. This 22 acre community is recognised as one of the Caribbean's most stunning marinas. The resort is situated in historic Speightstown, an area of Barbados with a fascinating history and incredible architecture, some buildings dating back to the early settlement of the island. Staying with us, you are also a short drive away from Limegrove Lifestyle Centre, Barbados' premiere duty free and tax free shopping destination. Sir Allan is a born and bred Barbadian. A happily married father of two, Allan loves the enduring charm of Speightstown. As a born and bred Barbadian, Sir Allan Fields aspired to owning a property on the unique Platinum coast in Barbados, famous for its white sand beaches, water sports, restaurants and up-market atmosphere that is synonymous with Port St Charles. The opportunity presented itself earlier this year when the this property became available. It was purchased, completely refurbished with modern appliances., high speed internet access throughout and comfortable yet elegant furnishings. 3.5 bathrooms: One has shower, tub, WC, bidet and marble top wash basin. The second has tub, WC and marble top wash basin. The third has shower, WC and marble top wash basin. There is generous cupboard space available throughout. Thanks so much Allan! The only problem with writing an excellent review is other people will rent when we want to go back! It will become even more popular! On the plane going home now- I would definitely rent again. To make this real I will post one criticism. The coffee maker is a French press. While other countries may enjoy that it is hard making coffee for a family of 7- too small. Delicious but small. So Allan please get a drip coffee maker (but if you do not we will still rent again!). Thank you for sharing your villa with us! Port St Charles has the most beautiful beach we've seen in Barbados and this property is a lovely place to stay and enjoy. The property is spacious, well maintained and equipped. The villa is just perfect - well equipped, well situated, and the owner is very hospitable. Port St. Charles is our favourite on the island for it’s tranquility, friendly staff, gorgeous landscaping and two beautiful beaches. Barbados hosts the most consistent and wonderful weather of anywhere we have been. If you want a very quiet gorgeous beach this is your place. We were blown away by some local restaurants. Plenty of room and privacy in this villa to accommodate us all. The plunge pool was an unexpected saviour on days we chose to stay close to home. Our family of 4, including a 9 and 13 year old, had a fantastic vacation here! The unit is beyond spacious, extremely clean and nicely decorated. The kitchen was stocked with everything we needed for cooking and we enjoyed our meals on the back patio overlooking the harbour. In the evenings we loved the sunset view from the second floor balcony. My youngest spent a good amount of time in the plunge pool and my oldest loved kayaking to the 2 beaches and snorkeling on the reef off one of the beaches. Port St Charles itself feels extremely safe and is absolutely beautiful, the landscaping is gorgeous and the harbour water is so blue! We even had a family of turtles off our dock. We rented a car and enjoyed exploring this wonderful island and walking into the nearby town of Speightstown. Allan was also a very pleasant and accommodating host; there was even a starter package of food when we arrived and he checked in during the vacation to ensure everything was going well. 5+ stars! We had an absolutely wonderful time here! The unit is very spacious (with tons of closet space) and the kids really enjoyed the plunge pool on the deck. The view from the 2nd-floor balcony is lovely and we liked sitting there on warm breezy nights (typical of Barbados). The place is very well stocked with lots of cooking necessities, towels, pillows, laundry detergent, a highchair, etc. Allan kindly left us a starter package of food, which was much appreciated and provided us with our first day's breakfast. 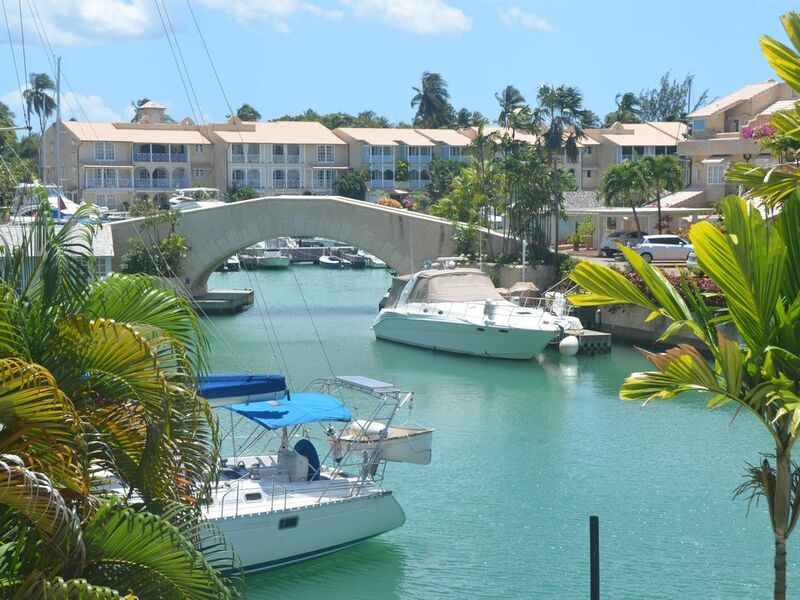 Port St. Charles is a lovely, quiet resort and we love the tranquility of the 2 beaches and the warm ocean water. We rented a car while there and enjoyed day trips around the island. As always (this is our 4th trip here), the people of Barbados are some of the friendliest people we've ever met and we enjoyed lots of conversations with locals while touring the island. I can't recommend Barbados and PSC enough!